Posted on 24/02/2012 06/12/2013 Categories aqua running, cross training, CycleLeave a comment on Last Chance – Thy Name is Bicycle! B&T, meet Mrs Physio. Mrs Physio, meet B&T. Came home, and thought I’d just try a little trot round the block on Sunday evening, as all was feeling good. Put on my lovely new shoes and set off into the sunset. Sounds very theatrical, but the sunset soon became ‘night’, and the short cut through the field turned into a wade through a swamp (how much rain had they had whilst we’d been away???) On the down side, my leg started feeling sore after only a mile. Decided enough was enough, and on Monday morning booked an appointment with a local physio, as recommended by a good friend of mine. Being a worrier, I now had 24 hours to panic in a “What will the physio do?” “Where will I park?” and the eternal worry – “What should I wear?”. Kind friends on Runner’s World advised me, so on Tuesday morning I grabbed my shorts and running shoes, stuffed them into a bag and shot off. What an interesting hour it was! I’ve never had someone poke, prod and then just stare at my legs for so long, whilst muttering “Interesting!” Turns out I was right, it is shin splints. Curiously though, my Physio thinks it my lovely new shoes which are to blame. Turns out my ‘wonky’ right leg, the one that wobbles all over the place when I run, has a lovely arch, so no obvious reason to over pronate on that side. My left foot, however, has a really flat arch, and is the one that would need the support. She thinks the new shoes are supporting my left foot okay, but giving too much support to my right foot, leading to the shin splints.My new shoes are stiffer than my old ones, so she also thinks I’m having to work harder to run in them. Sigh – sometimes you can’t do right for doing wrong! Funniest (and most embarrassing part of the session) is when she asked to see my running shoes, and I pulled my hastily grabbed trainers from my bag. Remember that muddy field I ran through on Sunday? Well most of it was still attached to my trainers as they came out of the bag, but then proceeded to drop onto her desk, carpet etc. Fortunately she just laughed, as I shamefaced tried to sweep up the mud droppings. So, she’s given me some stretches to do, and ordered ice and ibuprofen and NO RUNNING this week. Cycling and swimming have been suggested as alternatives …… hmm! Another appointment next week, when she’s booked the room with the treadmill in – my nemesis! 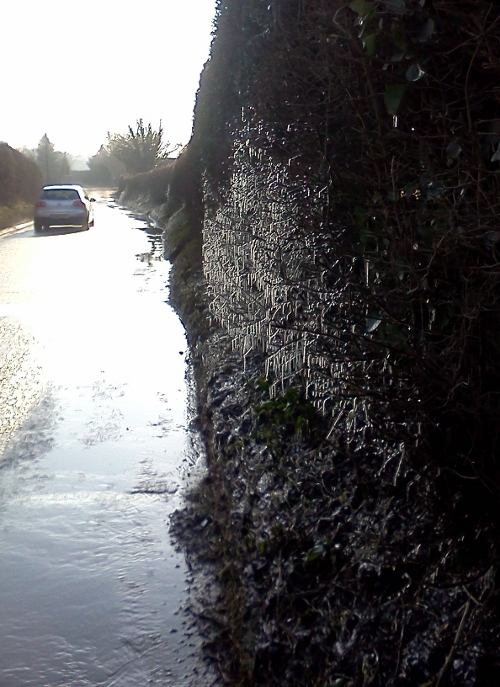 Large Puddle + car + Cold = Pretty! 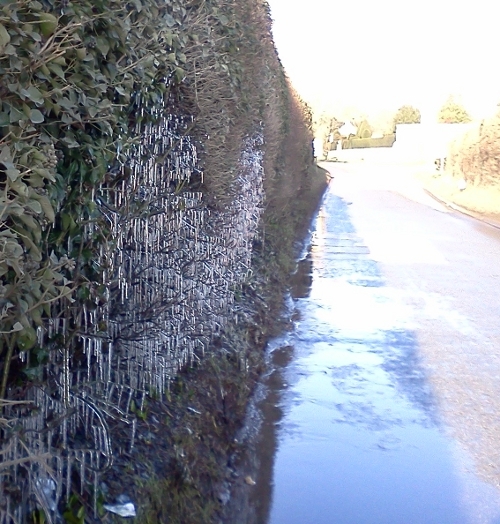 Posted on 07/02/2012 Categories UncategorizedLeave a comment on Large Puddle + car + Cold = Pretty! After all the excitement of Slaughterford 9, I knew I had to take this week more steadily. Also my legs were shouting at me and creaking in unusual ways – always a worry. So Monday morning I set off on a very gentle Recovery Run. 4 flat-ish mile in 50 minutes – that’s taking it easy! It was also freezing cold, so I considered it a full immersion ice bath as well. Tuesday – I missed this run (I was going to write that I skipped this run, but it sounded rather too energetic and I don’t want to give the wrong impression). Reckoned 3 runs in 3 days would probably be too much. Wednesday – Still freezing cold, still feeling creaky, so 4.5M in 48 minutes. Felt looser after first 2 miles, and also ran a little faster in order to warm up. Thursday – didn’t run again, as saving myself for my Long Run on Friday. Friday – schedule said 2 hours LSR, so off I set. It was -5C when I set off, so I wore my cheap rustle-y sweatbag running jacket. Set off on the 1 mile short loop into town, and just happened to pop into the public loos there. Well, there was no way I would be popping behind a bush further down the trail in those temperatures. After 2 miles, I was passing the car so dropped my jacket off. Kept new attractive fleecy headband and gloves on for another few miles, then was amazed I’d warmed up enough to stuff them into my pockets. I ran down the canal to Lacock. Really beautiful, they’ve done so much work on the canal, and most of it was frozen solid. I passed 2 swans swimming protectively in a hole in the ice they’d made – only about 1 metre wide, but just enough for them and no one else. I wasn’t going to argue with them – much too scary and too close to the tow path! In Lacock my right shoe was feeling loose, so I stopped and tightened my laces. Only took a few minutes, but felt really chilled when I stood back up. I had to rummage in my pockets and put my gloves and headband back on. I was feeling tired and ‘heavy legged’ on the way back, but pleased that I’d run my 10 Miles in 1:59. Back home, I did my usual stretching and had a lovely HOT shower until I felt human again. That’s quite a lot of water! By Saturday morning though, a particular spot on my right calf was really sore when I walked. So sore that I couldn’t walk without limping. the pain was a weird,sick-in-stomach type of pain. Fortunately I had nothing panned, so retired to the sofa with an ice pack and my laptop. Much Googling later, decided I have Posterior Shin Splints. Ow! Cue the RICE part of this week – Rest Ice Compression Elevation. Not too hard to lounge on the sofa, watching the first snow of the winter start coming down. By Sunday I was rather bored, and started feeling quite sorry for myself. Pain was less intense, and I was no longer limping, but it wasn’t the magical overnight cure I’d been hoping for. Today is Tuesday, and I’ve stopped rubbing in Ibuprofen gel and removed my crepe bandage. I’ve ordered a compression calf sleeve and am trying to be more positive. I can still feel it like a tightness when I walk, but am pencilling in a possible trot-around-the-block on Friday, but only if its totally recovered. Sorry this week’s blog is rather down hearted, but I’ve been feeling quite down and despondent. Hopefully on the up again, and promise to only post when I’m feeling happier.